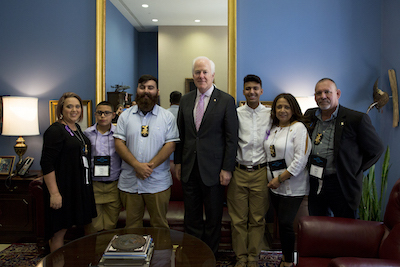 This week in Washington, D.C., I met with the family of fallen Border Patrol Agent Javier Vega Jr. and other Border Patrol agents. I then spoke on the Senator floor about the meeting and National Police Week. Excerpts of my remarks are below, and video of my remarks can be found here. Tragically, every year dozens lose their lives defending our communities and our freedom. This year as part of National Police Week, I am so thankful that Javier Vega Jr., one of Texas’ own, was honored at the National Law Enforcement Officers’ Memorial over the weekend right here in Washington, D.C.. Just a few hours ago, I had the honor of meeting his family, his wife, his children, and his parents, along with several of his friends that he served alongside in the U.S. Border Patrol. They know all too well the high cost paid by our law enforcement officers who put themselves at risk every day. Just like everything else he pursued in life, he dedicated himself to tirelessly serving others and serving his country. Sadly, that service was cut short when he and his family, while out on a fishing trip on a Sunday afternoon, were ambushed by two men who tried to rob them. Tragically, he was killed by the two men, illegal immigrant criminals, who had been reportedly deported but managed repeatedly to find their way back into the country, even after committing serious crimes. As we learned from the story of Javier, one obvious way to do it is by making sure that our federal laws are fully enforced to protect our communities from those who would take advantage of our generosity and commit violent crimes, even though they are not in the country legally. We have a chance to do more for our law enforcement officers, and we should always look for ways to do right by them. Now isn't the time to look the other way or to pretend that real problems facing our nation and our law enforcement community will simply go away. So during this year's National Police Week, I look forward to playing my part to put forward policies that better support their mission to defend and protect communities all across the country. Madam President, let me thank the family of Javier Vega Jr., particularly his wife, his children, and his parents who are here with us today for letting me share his story and honor his service. On August 3, 2014, Agent Vega was fishing in Raymondville, Texas when he was tragically murdered during an attempted armed robbery while protecting his family from two illegal immigrants suspected of ties to transnational organized crime. Agent Vega’s death was not immediately classified as a line of duty fatality because he was off-duty at the time. 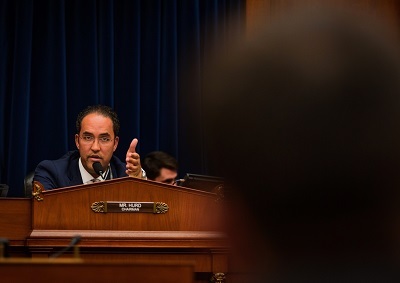 However, because he was responding to a clear violation of law, and it would allow his family to obtain survivor benefits earned through service to his country, Sen. Cornyn fought along with other members of the Texas congressional delegation to re-classify Agent Vega’s death as a line of duty fatality. Rep. Vela and I sent a letter on October 30, 2015, and again with U.S. Reps. Michael McCaul (TX-10) and John Carter (TX-31) on September 16, 2016 urging U.S. Customs and Border Protection Commissioner R. Gil Kerlikowske to reclassify Agent Vega’s death and help to make sure his family receives the corresponding benefits afforded public safety officers who are killed in the line of duty. In response to these efforts, Agent Vega’s death was re-classified as a line-of-duty fatality on September 21, 2016. Today Agent Vega was honored at the National Law Enforcement Officers Memorial, and Senator Cornyn gave a speech on the Senate floor about his service. I continue to press for benefits for Agent Vega’s family.